Leverage Capital Ratios vs Risk-Based Capital Ratios of U.S. Banks, a graph. 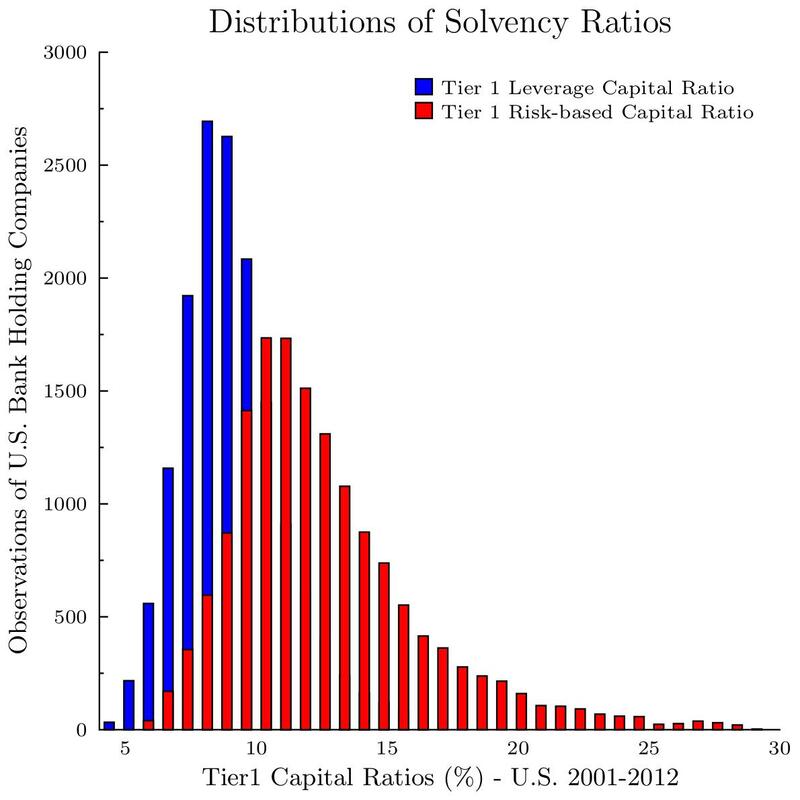 Following up on my graph on corporate versus bank solvency ratios, this graph illustrates the difference between two Tier 1 ratios reported by U.S. Bank Holding Companies over 2001-2012. The blue histogram shows the Tier 1 Leverage Capital ratio, the red histogram shows the Tier 1 Risk-Based Capital ratio. Both measures use the same numerator: Tier 1 capital. But, the denominator differs. The Leverage Ratio uses total accounting assets as denominator; the Risk-Based Ratio uses Risk Weighted Assets as denominator. It is interesting to see that the use of Risk Weighted Assets pushes the solvency curve to the right. As a result, the Risk-Based Ratio creates the impression of higher bank solvency than the Leverage Ratio. For example, using each ratio look how many banks appear perilous at the 5% mark. Graphs are made with GLE (Graphics Layout Engine).